WordPress vs. photography-specific platforms: where to build your site? How do you decide what platform to build your photography website on? You might be thinking of switching with WordPress, or you’ve heard good things about a different tool, and you’re confused. With many options to choose from, some generic ones and others dedicated to photographers, it’s sometimes hard to figure out which is better. Let’s try to navigate this “game of compromises”. I’m not going to tell you “hey, choose this…”, because it all depends on your business goals and level of experience. But I am going to walk you through all the relevant arguments and hard questions, so you can take an informed decision yourself. Because of its popularity, the WP theme and plugin ecosystems have really matured. You can now build almost anything on a WordPress site, it’s really incredible. Sure, there still are limitations in certain areas, you can match the functionality of image-selling platforms like PhotoShelter, the filtering and searching capabilities of big stock sites, or the features of dedicated client proofing tools like Shootproof. But unless you do need those advanced features (depending on your photography business), you can build almost anything with WordPress these days. Selling photo-based products can be done with plugins like WooCommerce (and its photography extension), GPP Sell Media or Sunshine Photo Cart, among others. And strong WP themes like The7, Avada, X-theme, Divi, etc. 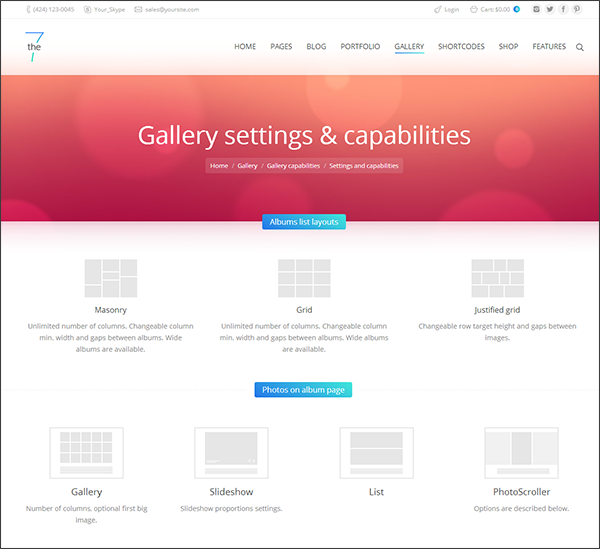 allow you to create all sorts of photo galleries, custom layouts, slideshows, lightbox effects & more. And all your static content and blogging needs are obviously taken care of, you have a ton of great plugins for almost everything. And strong WP themes allow you to create all sorts of photo galleries, custom layouts, slideshows, lightbox effects & more. Only some of these features can be replicated with WordPress, and even then, it’s a matter of bringing in multiple plugins together and trying to integrate them in a workflow. Whereas with a tool like PhotoShelter, you have all those photography-centric features under the same roof. So depending on your needs for the site, a photography platform might be a good fit for you. Squarespace – a good all-in-one solution for creating portfolio websites. You get a website builder (with plenty of templates to choose from), blogging tools, hosting, eCommerce, and even a domain registrar, all in one. It does however have some limitation and might be too simple for some. Wix – another good website builder for simple portfolio website. Weebly – yet another options to build simple website with a drag-and-drop builder. Shopify – an advanced eCommerce solution for photographers really interested in selling stuff. Looking for free website tools? Why? You get what you paid for. And you should take your business seriously. Photography platforms usually give you a choice of several predefined templates, but they have minimal customization options. You can tweak a few branding details and build your site structure, but that’s it. It is how it is. Even if you do have access to coding features, you’re still limited in what you can do with it, and you can extend to much of the site’s functionality. And that’s just for the general templates/layouts. When it comes to the actual eCommerce process, for example, you have zero control over how that works. With WordPress on the other hand, the sky is the limit. In terms of functionality, you use what your WP theme provides, then you have tens of thousands of plugins to choose from, and then extra PHP functions beyond that. Website performance also falls into this category. With a good WP performance plugin, and being mindful with the size of your images, you can get a blazing-fast site, whereas on other platforms you can really control the huge number of scripts that end up in the source code. How complex a platform is becomes the inverse of flexibility. WordPress is indeed more complex, and has a lot of moving parts. If you don’t have experience with it, you might lose yourself in all the theme and plugin options out there. Not to mention that once you install them, you still have to put everything together, configure plugins, etc. You could of course hire a web-designer, but that just speaks to the complexity of WordPress in general. Using a service like PhotoShelter or Smugmug is simpler. You get a functional portfolio site, that’s mobile-friendly and allows you to showcase your work straight away. Just add your images and take care of a few site-building stuff (logo, colors, fonts, navigation menu), and you’re done. This comes down to the ability to do something in particular with your website, so it depends on your goals. Do you need a huge image archive with advanced searching and filtering options, nested galleries, selling rights-managed image licenses, etc.? Then go with a photography platform like PhotoShelter, and accept its limitations in other departments. Need to sell both image prints or licenses and other products and services online (like books, calendars, portrait sessions, photo shoot deposits, workshops or photo tours, etc)? Consider using a WordPress-only site if you’re comfortable with a limited set of options when selling images, or go with a hybrid website approach (more on this below). Want to build other advanced features (an interactive map of your photo travels, complex booking forms, embedded videos and Instagram feeds, free wallpaper downloads, advanced blog categories and custom post types)? Then it’s clear. WordPress. Photography-specific platforms usually operate like a software-as-a-service (SaaS), so you pay a recurring monthly fee (with annual options, of course) to use them. WordPress is free, premium WordPress themes only need to be paid once, and WP plugins are usually free. Some premium plugins do require a yearly subscription (but they’re usually around $50/year or so). With WordPress, you also need hosting though. Cheap shared hosting plans are $3 to $5/month, while more professional hosting solutions are $15 – $40/month (but they’re usually worth it). More on WP hosting options here. If you’re serious on getting high in Google results, WordPress is definitely your strongest option. That being said, there are many successful photographers that use portfolio services and they’re doing fine. That’s because on-site SEO is only part of the equation. You might like the look of a platform, or the flexibility of another, but until you put your specific site needs on paper, you can’t make a final decision. When unsure, either contact each platform’s support team to get more info, or email me, I might be able to tell you what’s possible or not (I have experience with almost all platforms I mentioned above). Time-permitting, I’d be happy to offer a quick opinion. After researching each platform’s features, and assessing the pros & cons above, you might still be stuck, you might need features from both WordPress and a photography platform. That’s not the end of the world, in fact, many photography have integrated two different platforms to build a “hybrid” site. Austin Bat Tours (WP & Fine Art America) – navigate to Batshop > Austin Bat Photos to see the embedded FineArtAmerica page. matching design: ideally, both areas of your site should have a very similar design. Some platforms allow manual customization of the source code, allowing you (or a developer) to integrate them perfectly. Don’t forget that building a photography business is not just about choosing a website platform! That’s the easy part, anyone can set-up a quick site these days. But once you do reach this website decision, I hope that this article has helped you in know what your options are. And finally, don’t go into “analysis paralysis” mode, don’t procrastinate over your website. A website that limited (because you maybe chose the wrong platform initially) is better than having no website. This is all about putting your best work out into the world. Website platforms are just the tools to help you do that, but you have to bring the courage.